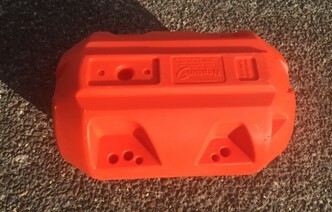 As part of its expanding product range and services to the UK aggregates industry, SLD Pumps and Power has sourced, tested and is stocking 4” and 12” pipe floats for application to pump hoses to reduce pump wear and reduce risk of breakdown under heavy duty loading and additional wear on the pump end. Heavy solids pumping applications can put strain on submerged hoses, especially when the suction hose is not in a clean body of water. There is a solution to this which both enables hoses to be placed in the deepest part of a lagoon and eliminates the chance of the suction hoses picking up heavy solid content by preventing the suction head resting on the bottom of the lagoon. That solution is to attach the SLD hose floats at regular three metre intervals along the hose. Floats can also be used to allow discharge lines to be placed on a body of water when space is at a premium. Floats can be retrofitted to any hose. Tapered ends to the floats decrease water and wind resistance. Tapered insides to the floats enable hoses to move freely.